Bamboo corals (Family Isididae) are an important component of seamount benthos south of Tasmania. Besides having lifespans of up to 400 yr, little is known about their basic ecology, nor how to decode potential climate signals encoded in their skeletons. We explored the stable nitrogen isotope and radiocarbon compositions of the skeletal organic fraction of the genera Isidella, Keratoisis and Lepidisis collected from 3 Tasmanian seamounts. Analyses were performed on tissues and organic node growth rings sampled at a temporal resolution of 1 to 4 yr. Radiocarbon chronologies exhibited nuclear bomb signals characteristic of surface waters and constrained radial growth rates to ~35 ± 10 µm yr–1 for 3 specimens of the genus Lepidisis and 113 ± 17 µm yr–1 for 1 specimen of Isidella. δ15N values of the living tissue and underlying gorgonin were similar and averaged 9 to 12‰. Records of δ15N from 8 different specimens showed subtle, quasi-decadal patterns over the last ~100 yr, although the amplitude of these features (~1‰) was similar to the average intra- and intercolony reproducibility. 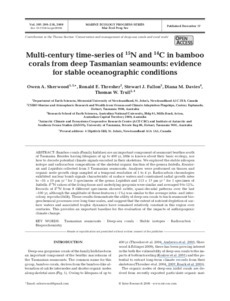 These results demonstrate the utility of deep-sea corals to track seamount biogeochemical processes over long time scales, and suggest that the extent of nutrient depletion of surface waters and associated trophic dynamics have remained relatively constant in this region over centuries. This provides an important baseline for the evaluation of the impacts of anthropogenic climate change.